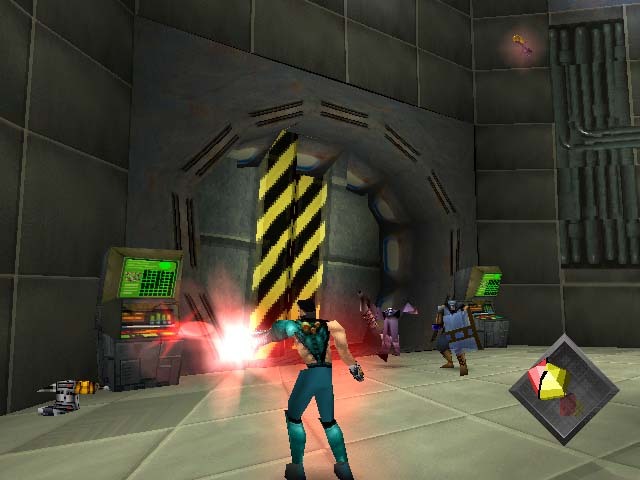 OverviewONE is a 1997 third-person action game for the PlayStation. It follows the story of John Cain, who wakes in an apartment to discover that one of his arms has been replaced with a gun. So...One. Not a very decriptive title. What is this all about? Well, One is a 3D shoot'em up, in the vein of the Contra series. You start with your guy and run from one area to the next spraying bullet death to all comers, through 5 large stages, split into smaller areas. Some areas are single plane (you run from let to right), some are fully free roaming, others are 3D in appearance, but 2D in essence. 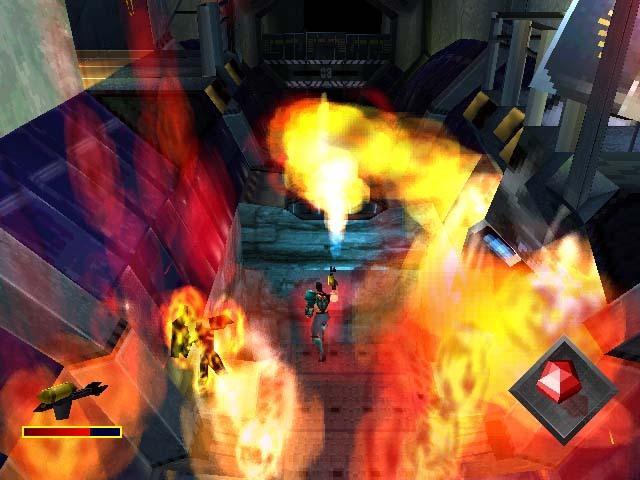 The game was quite impressive for the PSX, as it had quite beautiful graphics for both the locales and the (quintessential) explosions, and a very fitting soundtrack. What sets One apart from the other , it's gimmick if you will, is the lack of a health bar. Instead, you have a rage meter in the corner of the screen. It looks like a diamond shaped, kulticoloured...thingy. That fills up when you kill enemies and empties gradually as you get hit. If it empties (all the diamond's sides disappear), you die. If it fills up (all it' sides are bright red) you et a "Smart Bomb", which is like a blast wave of death and destruction. One is a relatively obscure game from the PSX's coniderably large library, but one that shoot 'em up lovers should enjoy at least once. My way too long, uncondensed review on the PSX title One, as seen on EmuParadise TV. 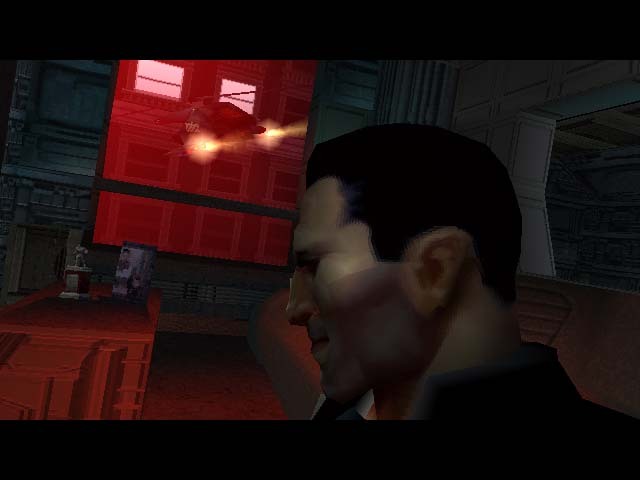 You play as John Cain, a man who has been biologically altered by a shadowy military force with cybernetic ambitions. Awaking alone on the floor of a dark apartment with his memory gone, Cain barely has time to sit up before he's attacked by heavily armed forces. 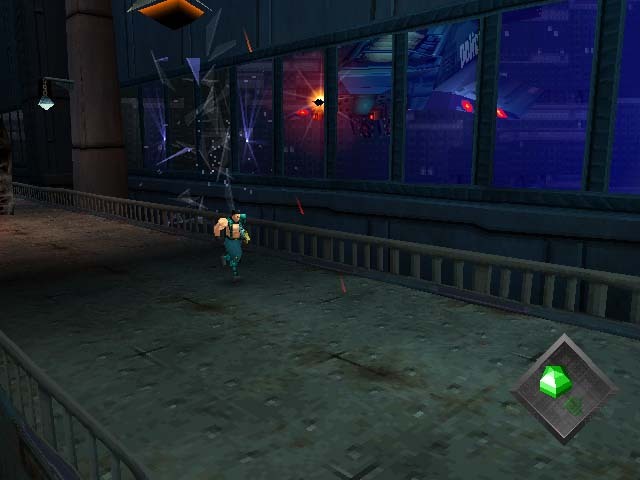 Barely escaping an explosion that obliterates the room he was abandoned in, the player then gains control of our hero in a long windowed corridor where an attack chopper hovers nearby, ready to pursue the seemingly vulnerable prey through the night. One is a single player 3D platform shooter with a mostly run-and-gun theme. The player is presented with conquering 6 lengthy stages, the objective of each being to defeat (or run from) the waves of enemies that appear in Cain's path while overcoming jumping platform challenges to reach the end stage boss. A handful of checkpoints along each stage allow Cain a convenient restart point when he inevitably falls to his death, but these only last as long as your default 5 lives do. When those run out, it's back to the start of the stage; if you haven't used your 3 continues up. Cain's hit points and destructive power are linked via a unique system; the rage meter. Whenever certain enemies or objects are destroyed, the rage meter gains power. 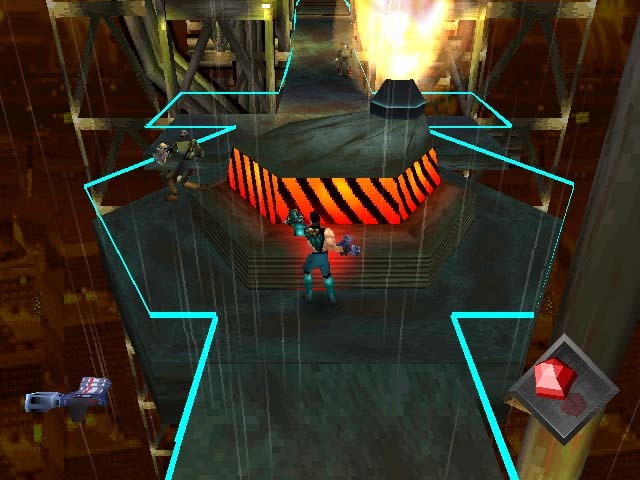 As the meter rises, the player's plasma cannon becomes more powerful, accurate, and can fire faster. With enough points gained, abilities such as a charged dash move and access to a one-off smart bomb become available. Conversely, taking damage lowers rage, and with it, all the benefits. If rage hits zero, Cain takes a dirt nap. Most of the plentiful and fairly diverse enemies can be defeated by blasting them with the plasma arm cannon, the limited-ammo special weapon you may have found on that stage, or closing the distance to pummel foes with kicks and punches. Boss battles, on the other hand, require special strategies to take down, as they are often immune to direct attacks. Discovering what exactly it is you're supposed to do while running around getting hammered can be frustrating, but the game's enemy voice actors sometimes drop hints for the solution. There are, unfortunately, numerous issues which nibble away at this game's score. Music and sound effects fit the high-tech industrial theme, but none will leave you wanting to hear any of the tunes once this game is off. Weapons fire and explosions are colorful but messy, with effects sometimes covering so much of the screen that critical jumps can't be seen to be made. 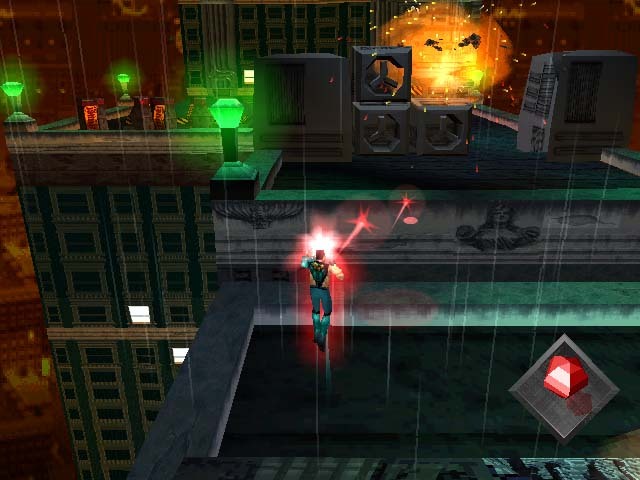 The camera is controlled entirely by the game's engine (with exception to L2 granting a bit of a zoom out mode), making it difficult to judge the many, many jump-or-die areas in each stage. 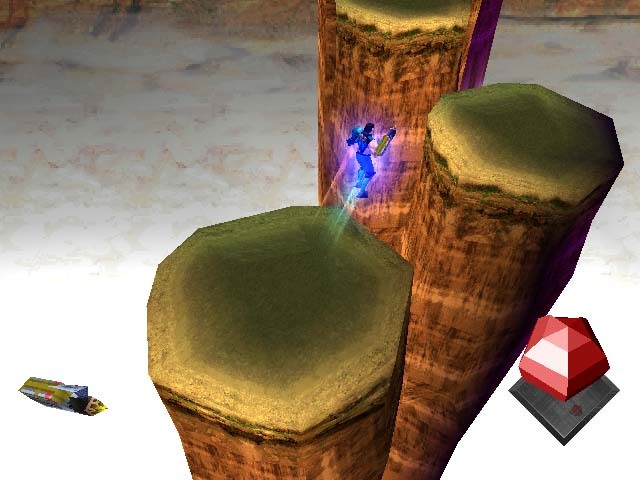 Worse still are the sudden shifts of the camera angle which can be disorienting and cause the player to lemming dive right off platforms. 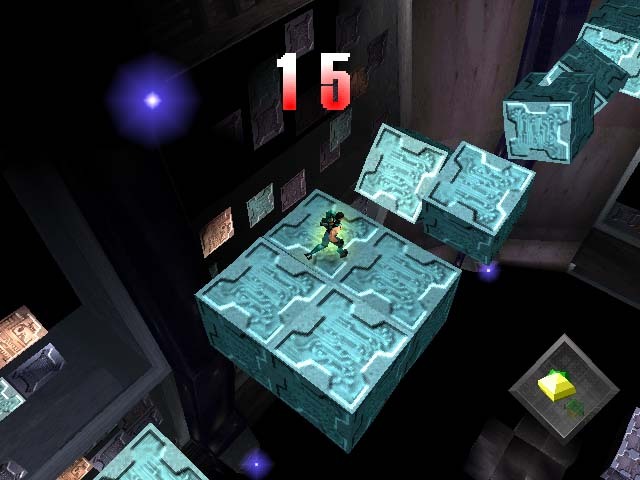 Players aren't given much time to learn the controls and movement nuances either, as the first stage thrusts you immediately into an escape scenario with no safe spot to test things out until later. Losing all accumulated rage and special weapons when you start the next stage isn't very rewarding either, resulting in forced character building every chapter. Now you can add videos, screenshots, or other images (cover scans, disc scans, etc.) for One [NTSC-U] to Emuparadise. Do it now! If you haven't noticed yet, we have a retro game of the day feature (top-right of the screen) wherein we feature a new retro title every single day! Now, you can vote for your favorite games and allow them to have their moment of glory. Click on the button below to nominate One [NTSC-U] for Retro Game of the Day.